These 2 videos both feature a famous Chinese Kung Fu and Zen Master who has his own martial arts school in the town of Dengfeng, near the famous Shaolin temple. In Master Wu Nanfang and Shaolin Wugulun Kung Fu the Master gives the history of his Kung Fu lineage, which descends directly from his own great grandfather. Wugulun was one of the most famous monks in the Shaolin temple in the 19th century and his more internal form of martial art was preserved in secret down the generations. In a secluded part of the Shaolin temple itself Master Wu Nanfang shows in detail, with the help of some of his students, the difference between this internal form and the more acrobatic forms which have become synonymous with the Shaolin temple in recent years. He also answers questions from an English friend about the relationship between peaceful Buddhism and this apparently violent activity – beneath the actual cave where Bhodidharma meditated and introduced Zen – or Chan – to China. 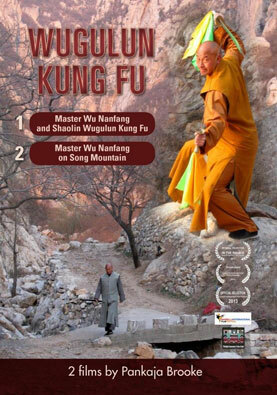 Master Wu Nanfang on Song Mountain is a more intimate look at the Master in his small school as he shows how Kung Fu arts can be practiced in everyday activities like farming. With the help of an 8 year old student he does some calligraphy – in the middle of a heavy storm. We also see a couple of students fighting, putting into practice some of the lessons they have learned. But most of the film shows the Master performing some impressive forms perched on a crag in the middle of beautiful Song Shan – the central one of China’s five sacred mountains, with an accompaniment of classical Chinese music. Since these films were made the school has moved into beautiful new premises.